Apple made its third semiconductor company acquisition in a stealthy manner by not making any public announcements. The alert online community discovered via some careful sleuthing that Austin, TX based Intrinsity Inc's employees had started to work for Apple from the beginning of April 2010. SEC filings made by Apple for its quarterly earnings report on April 20, 2010 indicated that Apple spent around $325 million for business acquisitions. Though Intrinsity's name wasn't publicly disclosed, a knowledge of Apple's recent acquisitions indicated that the total amount was spent on Quattro Wireless, LaLa and Intrinsity. Quattro Wireless was purchased for $275 million and TechCrunch had previously suggested that LaLa was purchased for $17 million. Based on this, some infer that Apple spent less than $50 million in order to grab Intrinsity's tech and employees. However, the NYTimes report confirming Apple's acquisition quoted analyst Tom Halfhill in suggesting a purchase price of $121 million. The analyst contends that that Apple may not have paid all the money at once or 100% in cash. That, he says, may account for the lower estimates that people derive from Apple's publicly disclosed expenditures. This is very much within the realms of possibility, but people suggesting that Apple paid less than $50 million for Intrinsity say that this doesn't take into account the financial state of Intrinsity in the few months preceding the acquisition. Let us take a brief detour to trace Intrinsity's history and analyze this further. Founded in 1997 by 22 veterans in the microprocessor design industry, the firm initially worked towards developing interesting circuit design techniques and related design infrastructure for performance improvement (speed of circuit operation) using domino logic. If you are interested in the details, there are some course slides from MIT to help you out. Intrinsity's website also had a 'Technology' section devoted to detailing their version of domino logic. The summary is that it is a circuit level technique which gets rid of the slow components inside the transistor level implementations of the various logic gates / functions. This makes it unsuitable for the usual design flow (writing RTL code in a hardware description language, followed by synthesizing it using automated computer tools to get a gate level description, which is then translated to the actual chip layout by placing and routing the standard cells corresponding to the generated gate netlist). Creating standard cells for domino logic is not an easy task, and companies often prefer to just handcraft the relevant logic in domino style in the slowest part of the circuit. Intrinsity has developed a design flow using domino logic cells, called Fast14. However, the whole flow is specific to a particular foundry's process node, and shifting to a new foundry or process requires quite a bit of rework. Usually, the foundries provide the standard cells, but, in this case, one is reliant on Intrinsity to supply the cells. This is usually much later than the delivery date for the static CMOS standard cells. This is the main reason for the flow to be not as popular with fabless semiconductor companies as the usual design flow. On the other hand, companies like Intel devote huge amount of resources to perfect the layout of each and every gate in their pipeline to get the requisite performance. It is believed that Intel also uses a variant of domino logic for designing many components in their datapath. Intrinsity's approach (as well as the associated delay in taping out the chip) lies somewhere between the static CMOS standard cells flow used by most companies and the full custom approach used by ones with lots of resources. After five years of flying under the radar (by which time the headcount had increased to 80-odd and $15 million had been burned through), Intrinsity finally managed to tape out a chip using their domino logic scheme towards the end of 2002. This DSP-centric processor (called the FastMath) was able to clock an impressive 2GHz in TSMC's 130nm process. It enjoyed critical acclaim, but business for this chip wasn't exactly forthcoming. 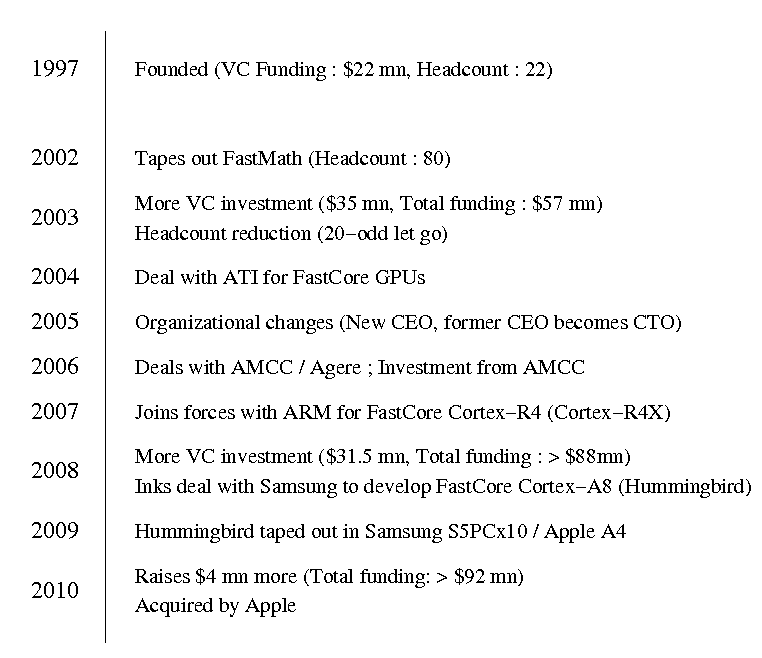 In May 2003, with just around $7 million left in the bank, Intrinsity was forced to get back to the VCs for more funding. An investment of $35 million followed which was supposed to be used for sales efforts. However, taking the processor into full production had to be shelved following general market apathy towards a DSP from a relatively unknown company. In order to keep down the cash burn rate, 20-odd employees had to be let off. With no revenue stream available, Intrinsity decided to begin efforts to license their technology to other fabless semiconductor companies. As outlined in the 'Technology' section, convincing companies to ditch their original design flow for something novel like domino logic is not easy. In February 2004, they entered into a deal with ATI, wherein, the technology would be used for a multitude of future ATI GPU designs. This lent them financial stability for some years. In early 2005, there were some organizational changes, with the old CEO moving into the role of a CTO, and the hiring of a new CEO. Deals with AMCC and Agere Systems followed in 2006, generating some more revenue. For AMCC, Intrinsity helped develop the Titan core based on the embedded PowerPC architecture. AMCC even invested and got some stake in the company. 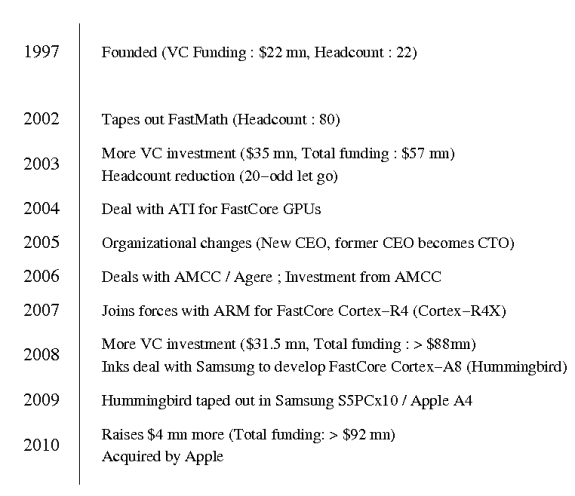 Business began to look up as ARM joined hands with Intrinsity to develop a FastCore version (the tag given by Intrinsity to any logic core synthesized with their Fast14 domino technology) of the Cortex-R4 called as the Cortex-R4X in 2007. Analysts expected a FastCore version of the Cortex-A8 to have very good performance too, but ARM didn't appear too interested in pursuing that line. Despite all these deals, the expenses were still high, and Intrinsity had to snag more investments. In early 2008, $31.5 million was obtained in a Series E funding round, bringing the total money raised to more than $88 million (The amount of money invested by AMCC in exchange for stake in the company isn't public). In September 2008, Samsung went against ARM's suggestion that any semi-custom implementation of the Cortex-A8 wouldn't be faster than TI's OMAP3 version. They inked a deal with Intrinsity to develop a FastCore version of the Cortex-A8 called as the Hummingbird. In the meanwhile, Apple was also looking for a way to speed up the Cortex-A8 for their iPad. It is believed in industry circles that Samsung asked Intrinsity develop a FastCore version of the Cortex-A8 at the behest of Apple for A4, and also ended up using it for the S5PC110 / S5PV210 after splitting the cost (according to rumors). The hardening was completed in July 2009, just in time for the rest of the A4 SoC to be taped out for the iPad and the S5PC110 for the Samsung Galaxy S.
Intrinsity also raised $4 million in late January 2010 from 11 different investors, bringing the total amount raised by the company closer to the $100 million mark. The LinkedIn page for Intrinsity suggests that they had around 120 people at the time of acquisition. For such a company, $4 million is barely sufficient for a quarter's expenses. It must have been known at that point of time that the company was fast running out of cash and would need to be sold. The above timeline also indicates that Intrinsity had to keep hunting for investment and was never able to sustain profits for long. The LinkedIn page of one of Intrinsity's employees indicates 'Controller at Intrinsity (Assets Acquired by Apple Computer)' in the 'Past Experience' section. It is believed that 'asset acquisition' is different from a straightforward 'acquisition' in the sense that it is more of a 'fire sale' rather than a purchase based on the true valuation of the company's technology. This is not surprising, considering the fact that Intrinsity's financial position appears to have been precarious in January 2010. All these tend to make some people in the industry believe that Apple could have got hold of the company by offering them a rock-bottom price. This, they suggest, may also be the reason why Intrinsity wouldn't want the purchase price made public, as it would show their investors as well as the value of their technology in poor light. While introducing the iPad in January 2010, Steve Jobs specifically commented on A4 as the best and most complicated chip Apple had ever designed. Industry watchers were skeptical when it became obvious that the A4 was just a SoC hooking up various IPs available from different companies. Once it became evident that Apple had indeed purchased Intrinsity, Steve Jobs's claim began to make more sense. In effect, Apple had developed their most advanced silicon to date! Articles like this are outstanding. Articles providing insight into the semiconductor industry players always seem to be my favorite. Visits to Nvidia's offices, graphics architecture chats with AMD/ATI, and Intrinsity's acquisition are very much appreciated. Anand, this part doesn't make much sense: "On the other hand, if the aim was to prevent the competition from getting access to this technology, it may succeed to quite an extent." dagamer34, Thanks for your observation. Maybe, the context wasn't clear in the article. My intent was to suggest that Apple might not want other companies like TI / Nvidia / Broadcom etc. to be able to utilize Intrinsity's Fast14 technology (not Cortex-A8s or Cortex-A9s in general). That doesn't necessarily mean domino logic isn't useful anymore. Nehalem had simply gotten to a point of complexity where hand-designing domino circuits (especially since they moved to an internal IP-based chip assembly flow) was too cumbersome considering the benefits (and I suspect their 32nm node was a bit too variable). In much smaller processors like the A9, it could indeed benefit. Now, there are significant trade-offs to domino logic -- area and power will suffer -- but if strategically used, it can definitely give a competitive edge in A9 class processors.